A healthy diet should contain lots of whole grains. Whole grains contribute to a number of health benefits in the body including improved digestion, better blood sugar control, and a lower risk for certain cancers. For many, rice is a major component of a whole grain diet. However, the FDA has recently been looking closely at rice due to concerns about possible arsenic contamination. When most people think of arsenic, they think “poison” and this association is correct. Arsenic is highly toxic. It’s found naturally in many minerals. For that reason, trace amounts of arsenic can occur in water, air, soil, and even foods. When arsenic occurs naturally in foods, it’s called organic arsenic. When it occurs inorganically (the result of contamination from human activities), it is extremely toxic. The presence of inorganic arsenic can be traced to industries that use minerals to produce products needed by people. These industrial processes include coal-fired power plants, mining, and smelting. Arsenic is released into the air as a by-product and eventually settles in our water and soil. Certain foods may also be particularly at risk for contamination due to the use of pesticides containing arsenic. The FDA has been monitoring levels of arsenic in rice for decades now. But lately, there has been a spate of testing going on at the government laboratories. FDA researchers tested over 1,000 samples of rice and rice products in order to determine arsenic levels. Specifically, the FDA was concerned about any health risks that might be associated with the consumption of these foods once they reach the U.S. The FDA was quick to assure consumers that these levels of arsenic weren’t high enough to cause any immediate or short-term adverse health effects. However, many are still concerned about the long-term effects of arsenic consumption. The FDA is going to look into this issue, but it will likely take time for answers to surface about the effects of long-term exposure to inorganic arsenic. In the meantime, other medical experts are calling for the FDA to set a limit for the amount of arsenic allowable in foods. There is currently no such regulated upper limit. For now, health experts are recommending that you eat a variety of whole grains. That means adding foods like quinoa, whole wheat, buckwheat, millet, spelt flakes, and oat flakes to your weekly diet. In general, the level of arsenic found in foods varies depending directly on the levels of local contamination where the food is grown. Environmental levels of arsenic, in turn are affected by a number of factors. Food grown near urban areas will likely have higher arsenic levels than food grown in rural areas. Food grown near industrial plants will probably have the highest exposure to the chemical. As for water, levels of arsenic are lower in seawater and higher in rivers and lakes. Well-water taken from a deep well may potentially be high in arsenic if the water comes into contact with arsenic-rich mineral deposits. “FDA: Low Levels of Arsenic in Rice,” MedlinePlus web site, Sept 6, 2013; http://www.nlm.nih.gov/medlineplus/news/fullstory_140440.html, last accessed Sept 9, 2013. 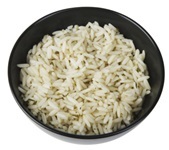 “Arsenic in Rice and Rice Products,” The Food and Drug Administration web site, Sept 6, 2013; http://www.fda.gov/food/foodborneillnesscontaminants/metals/ucm319870.htm, last accessed Sept. 9, 2013.